There are many ways to secure your personal data, but if you have a lot of files and folders you want to keep completely private, then you really need to be looking at a hardware solution. 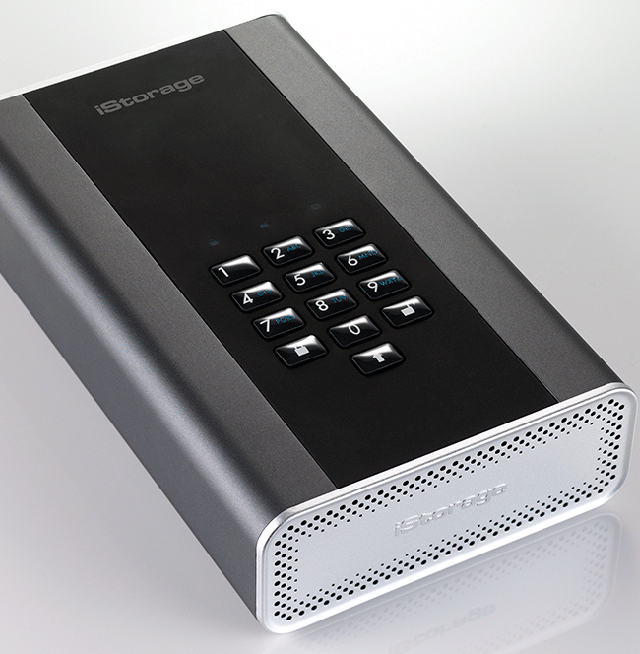 iStorage sells a range of external OS and platform independent USB drives that use hardware-level, real-time military grade AES-XTS 256-bit encryption to secure your content, with access via a built-in PIN pad. The company offers both PIN-protected flash drives and portable USB drives, and its latest offering is the diskAshur DT2, an ultra-secure USB 3.1 desktop hard drive that’s available in a range of capacities, from 1TB right the way up to 10TB. I’ve been testing the 4TB model for a couple of months, and it’s fantastic. Unlike the USB-powered diskAshur Pro 2 I reviewed five months ago, the diskAshur DT2 requires an external power source. The 12V AC adapter for this is to be found in the box, alongside the drive itself, a quick start guide, and the required USB Type A cable. You also get free serial numbers for two optional programs you can download. These are iStorage DriveSecurity (powered by ESET NOD32 antivirus software) and Nero BackItUp. Once powered up and connected to your computer, unlocking the drive is just a matter of tapping your PIN -- which can be any length from 7-15 digits long -- into the large keypad, and then pressing the unlock button at the bottom right. There’s no indication you’ve entered correct or incorrect digits until you press the unlock button. To secure the drive again, you just need to press the lock button, or eject it. The drive also automatically locks itself after a period of inactivity. A row of three LEDs above the keypad show the drive’s status -- A red closed padlock means the drive is in standby/locked, a green padlock means it’s in user mode/unlocked, and the blue A is admin mode. Like diskAshur Pro 2, the diskAshur DT2 is fully tamper-proof/tamper evident and protected using EDGE (Enhanced Dual Generating Encryption) technology. This is a dedicated hardware-based secure microprocessor (Common Criteria EAL4+ ready) with built-in physical protection mechanisms that encrypts both the data and the encryption key. There are read-only (write protect) and read/write modes, and the drive comes with a desk lock slot to prevent anyone just walking off with it when secured. There’s also a drive reset feature, which clears all PINs and data, and creates a new randomly generated encryption key, so you can reset and redeploy the drive as many times as needed. Like all diskAshur models, the DT2 comes with a default PIN programmed in, and one of the first things you’ll want to do is change this. Hold down the unlock and number 1 buttons when locked/in standby, then enter the default PIN, and press unlock. This will put you into admin mode. Hold down unlock and the number 2 button, and enter a new PIN, followed by unlock. Re-enter the PIN a second time, and press unlock, then press lock. You can't use all sequential numbers (no 1234567) or repeating numbers (2222222). The alphanumeric keyboard lets you lock the device by spelling out words, and a shift key lets you to make the PIN even harder to guess. You can create a guest PIN as well as an Admin one, if you want to give someone else access to the drive’s contents. The keys are coated in strong epoxy resin to prevent the most frequently used digits being revealed through wear, and the drive can intelligently protect against brute force attacks. After five consecutive incorrect PIN entry attempts, the drive will freeze, requiring you turn it off and back on again. After another five incorrect PIN entry attempts (10 in total), the drive will freeze once more, requiring you to hold down Shift when rebooting the locked drive. After yet another five consecutive incorrect PIN attempts the drive will delete the key and lock itself. At that point the only option is to perform a factory settings reset. The diskAshur DT2 drives are produced to a very high standard, and available in 1TB, 2TB, 3TB, 4TB, 6TB, 8TB and 10TB capacities. 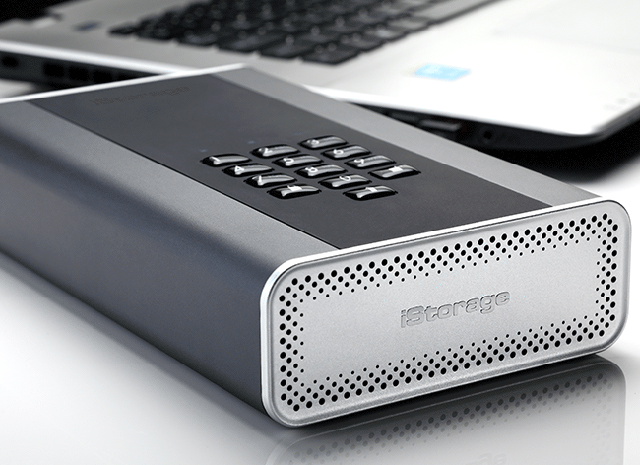 They are priced from £179/$237 (1TB) to £679/$899 (10TB) and available to buy directly from iStorage, or Amazon. If you have personal data that you want to ensure remains secure and won’t ever fall into the wrong hands, I'd definitely recommend the diskAshur DT2 range of USB 3.1 encrypted desktop drives. They look good, are easy to use, fast, and offer some of the best advanced data security around. What more could you ask for?